De toegang tot deze kleine Britse militaire begraafplaats. Een zicht op Suffolk Cemetery. 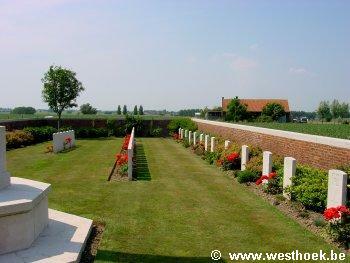 Suffolk Cemetery is located 6 Km south west of Ieper town centre, on the Kriekstraat, a road leading from the Kemmelseweg. (Joining Ieper to Kemmel N331). From Ieper town centre the Kemmelseweg is reached via the Rijselsestraat, through the Lille Gate (Rijselpoort), and straight on towards Armentieres (N365). 900 m after the crossroads is the right hand turning onto the Kemmelseweg. (Made prominent by a railway level crossing). 5 Km along the Kemmelseweg lies the right hand turning onto Vierstraat. 800 metres along the Vierstraat is the left hand turning onto the Kriekstraat; the cemetery is located 50 metres further on the right hand side of the road. 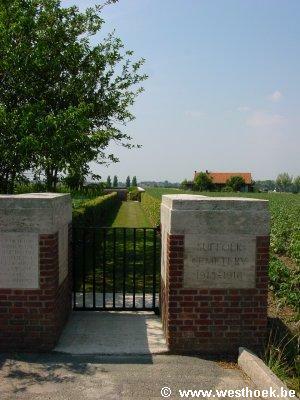 This cemetery was begun in March and April 1915, by the 2nd Suffolks; used for another burial in November, 1917; and used by the 38th Labour Group in October, 1918, for the burial of men who fell in the previous April, and of whom all but two belonged to the 1st/4th and 1st/5th York and Lancasters. On the last occasion it was described as Cheapside Cemetery, after the name given to the road which runs South-Westward from it. There are now nearly 50, 1914-18 war casualties commemorated in this site. Of these, almost one-fifth are unidentified. The cemetery covers an area of 384 square metres and is enclosed by a concrete curb.